In the ‘04-’06 Subaru STi, there was unfortunately no option for a 60/40 folding rear seat or any sort of pass through. This was a bummer to find out about since I wanted to be able to easy transport my snow skis as well as other stuff without having to install a roof rack. Well this is still possible if you go and just remove the back seats entirely! The convenient way was added in the 2007 model but Subaru also included the added bonus of a transmission made out of glass, so I will gladly keep my setup instead. 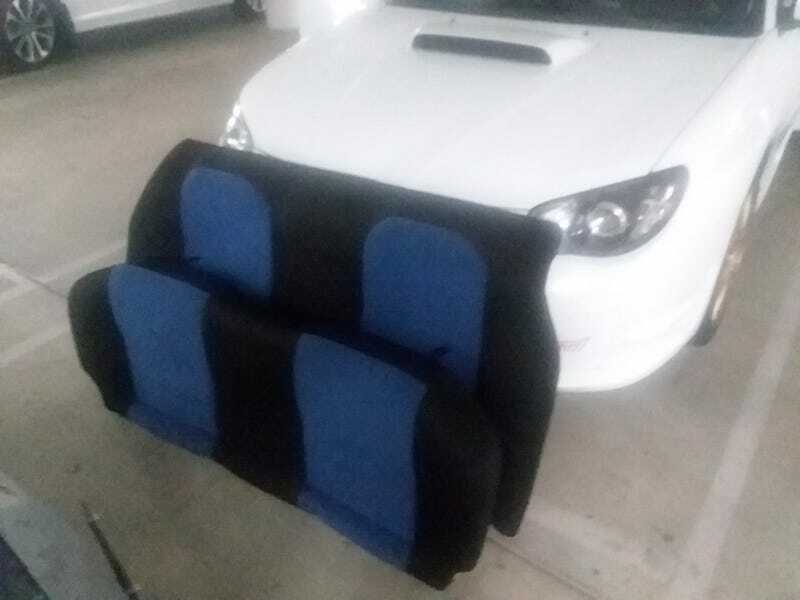 Removal of the back seats normally would require me to: remove two 12mm bolts for the bottom seat cushion, remove the the bottom seat cushion, remove three 12mm bolts for the top cushion, remove the top cushion, pop out the clips for the foam insert, and remove the foam insert. But I discovered that the bottom seat cushion bolts were entirely missing so I was able to skip a step there. I will need to stop at a hardware store to get some new bolts so that the seat is properly secured. Silly previous owner, losing bolts. Anyways, the goal was to fit this giant missile into the car. My new hard sided ski case is pretty bulky to protect the skis on an airplane but is a bit more cumbersome to transport in a car. I actually found that when fitting it into the car with the back seats removed, I could no longer shift the car. So that wasnt going to work anyways. The case is adjustable though so I may be able to work it in. However, I was just able to fit the skis inside the passenger cabin diagonally from the drivers side rear to the passenger side front, with the back seat still in the car. The only problem is I lose the ability to have a front seat passenger which is kind of awkard to drive someone uber style with the passenger in the back, passenger side. But it would work until I get a roof rack!